Peter Schreyer has achieved much during his time, and it seems he’s set to achieve much more by leading South Korea’s Hyundai Motor Group in gaining a world-class reputation, Automotive News reports. With that, the group – which controls both Kia and Hyundai – will be looking to dispel its reputation for cheap cars starting with a few vehicles unveiled recently. At the New York Auto Show, two important prototypes were unveiled from both brands, Hyundai’s Genesis – which will go against German brands, BMW and Mercedes-Benz – and the Kia Cadenza, which will take on full-sized cars like the Toyota Avalon in the US. Also unveiled, and of equal significance was the Hyundai Ioniq, which will be sold in plug-in hybrid, hybrid and electric form. The deal here is to keep both brand identities distinct. Kia will carry a youthful, sporty image and Hyundai, towards a more traditional, German form of elegance. Meanwhile, independent auto analyst Alan Baum stated that the company has been pushed to seek luxury car revenue more aggressively. Also, sales forecasts of Hyundai and Kia vehicles are seeing a weak increase due to slowing demand from China and a higher won, which has put the pressure on Schreyer. That said, the designer is calm despite this and will continue with what he does best: design. In an interview, Schreyer explained that he goes by two disciplines. The first is to focus design on the car’s functions rather than flowing lines, while the second is to stop fighting for small refinements as they can interrupt engineering and manufacturing. 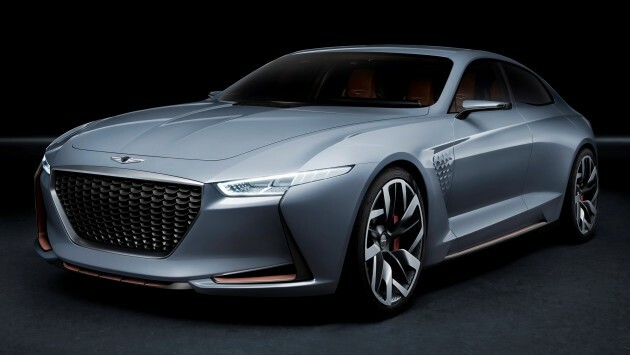 According to him, the Koreans are looking “straight past Japan” with new brand Genesis, taking direct aim at German brands such as Mercedes-Benz. The reason being, Honda’s Acura brand and Nissan’s Infiniti have both failed to match the Germans in terms of sales and pricing power. Again, Schreyer hopes to achieve this via design, which is why he’s approaching designers from Bentley and Volkswagen. Meanwhile it was revealed that six new vehicles will be introduced in the next few years. Vehicles include sedans, crossovers and sport utility vehicles. Having spent a number of years as a journalist for a local paper, a marketing executive for a popular German automotive brand and a copywriter, Graham, a true-blue Sarawakian, knew he had to take the leap back into the motoring scene - and so he did. To him, nothing’s better than cruising for hours along a scenic route, in a car that’s designed and built for that purpose. my only concern is will hyundai be too conservative and offer a little differentiation than kia models, as how things develop in recent years? kia and hyundai used to look rather differently, but nowadays not so much already. Proud to see these Asian brands making the effort and taking steps to gradually by leap and bounds to stand shoulder to shoulder with the European automobile elites. Sure they had made some bad decisions and not-so-good products but it was just growing pains. These brands now have got to a good footing to finally run with the big Germans. In fact they are constantly winning accolades both in the US and Europe. That’s world-class. Onwards Kia-Hyundai!! P2 only bows to their jepunis overlords. So how to unite?